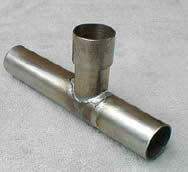 •	Superb versatility – welds practically all types of metals including cast iron. •	Ideal for both tight joints and filling. •	Provides easy “fool-proof” all-position application. Trust 200 FC Multi-purpose Flux Coated Brazing Alloy is the “All-Rounder” for virtually any metal or combination of metals. •	Trust 200 FC provides superb versatility – welds practically all types of metals, including cast iron. •	Trust 200 FC is ideal for use with tight joints and gap bridging or filling use. • Trust 200 FC is the right choice for easy “fool-proof” all-position application in almost any situation. •	Joins galvanized without damaging sensitive zinc coating. •	Is effective even on rusty or dirty metals. •	Has high wettability to reduce distortion even on thin sections. •	Provides superior fluxing action to enable solid bonding on difficult metal combinations. Trust 200 FC has a special affinity for cast iron, but also gives excellent results with galvanized iron, brass and steel. Can be used effectively on thin metal. •	Tensile Strength 71,000 p.s.i.